WATSON, James Eli, a Representative and a Senator from Indiana; born in Winchester, Randolph County, Ind., November 2, 1864; graduated from De Pauw University, Greencastle, Ind., in 1886; studied law; admitted to the bar in 1886 and commenced practice in Winchester; moved to Rushville, Ind., in 1893 and resumed the practice of law; elected as a Republican to the Fifty-fourth Congress (March 4, 1895-March 3, 1897); unsuccessful candidate for reelection in 1896; elected to the Fifty-sixth and to the four succeeding Congresses (March 4, 1899-March 3, 1909); was not a candidate for renomination in 1908; unsuccessful Republican candidate for governor of Indiana in 1908; resumed the practice of law in Rushville, Ind. 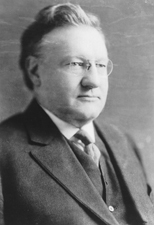 ; elected on November 7, 1916, as a Republican to the United States Senate to fill the vacancy caused by the death of Benjamin F. Shively; reelected in 1920 and 1926, and served from November 8, 1916, to March 3, 1933; unsuccessful candidate for reelection in 1932; majority leader 1929-1933; chairman, Committee on Woman Suffrage (Sixty-sixth Congress), Committee on Revision of the Laws (Sixty-sixth Congress), Committee on Enrolled Bills (Sixty-eighth Congress), Committee on Interstate Commerce (Sixty-ninth and Seventieth Congresses), Republican Conference (Seventy-first and Seventy-second Congresses); continued the practice of law in Washington, D.C., until his death there on July 29, 1948; interment in Cedar Hill Cemetery, Suitland, Maryland. American National Biography; Dictionary of American Biography; Watson, James Eli. As I Knew Them: Memoirs of James R. Watson, Former United States Senator from Indiana. Indianapolis: Bobbs-Merrill Co., 1936.